Social media can be a field of landmines for lawyers and their marketers. It's all too easy to tweet a statement or post a blog piece that ends up running afoul of ethics rules for legal marketing. That's why so many legal marketing agencies, Furia Rubel included, spend so much time advising attorneys and their marketers on the ins and outs of social media. We field questions from clients and colleagues and write about both the opportunities and the things to be wary of when attorneys and law firms turn their attention toward social media. In honor of the holidays, the Legal Marketing Association Social Media Special Interest Group has pulled together some amazing resources in their 12 Days of Social Media list. The 9th day's list is a handy compendium of legal marketing blogs that should be on everyone's daily reading list. Furia Rubel was honored to be listed among them, but there are plenty more to check out. 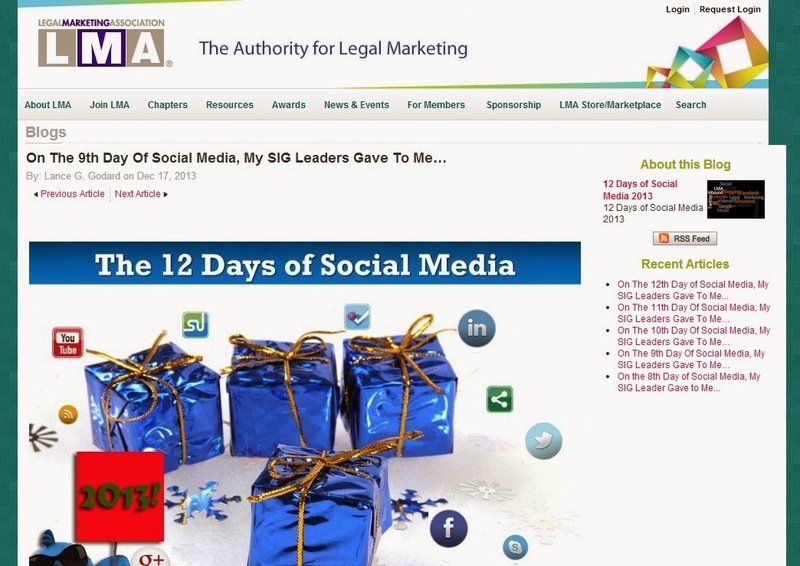 To see which legal bloggers are leading the way in thought leadership, check out LMA's website. While you're at it, be sure to check out the previous days' offerings. From advice on using LinkedIn to funny videos of LMA leaders to 12 Tips for Twitter, you'll find plenty of great information to help you make some new year's social media resolutions. Top Words of 2013: What Ones Do You Use?